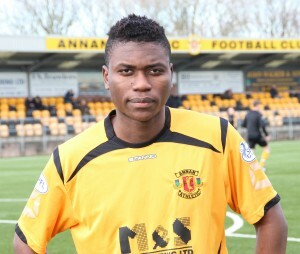 Annan came back from the brink of defeat to earn a valuable point and keep alive their hopes of a play off place. It looked a tall task for Annan as Berwick went 2 goals up at the start of the second half but Annan fought back superbly to grab a share of the points in a game which Berwick had within their grasp. After 3 consecutive defeats this was a massive result for Annan and with Clyde, East Fife and Elgin all being defeated the fourth spot play off place is still very much in the balance. Annan boss Jim Chapman was forced into rearranging his squad with Peter Watson suspended, his place being taken by Steven Swinglehurst and on loan Celtic player Jack Breslin started his first full match at full back for Annan. Annan were first to attack when Keeper Billy Bald intercepted Ryan McStay’s through ball in the 2nd minute, this was followed by a Stuart McColm effort in the 8th minute which went past the post. Berwick were presented with a golden opportunity in the 12th minute when Swinglehurst’s short pass back was intercepted by Andrew Russell but Hart denied him when he blocked the attempt on goal and Colin Cameron following up blasted the ball over the bar form 25 yards. Hart dealt with efforts from Lavery and Willis before both teams were forced into making changes in the 20th minute. It was a nasty incident when Keeper Billy Bald punched the head of Martin McNiff who was attempting to head an Andrew Mitchell free kick goalwards. Martin McNiff was out cold for a few minutes and Bald sustained suspected broken fingers. Bald was replaced in goal by Michael Andrews and Martin McNiff was replaced by Rabin Omar. Annan’s best movement of the half in the 30th minute culminated in Weatherson’s shot being tipped past the post and from the resulting Andrew Mitchell corner Ryan McStay’s shot was blocked. Berwick forced their first corner in the 33rd minute and Hart denied Kerr Young with a comfortable save. Scott Maxwell struck a good 25 yard effort in the 33rd minute which flashed past the post. As the match approached half time a mistimed Black clearance resulted in a corner but once again Kerr Young was denied by a comfortable Hart save. The game appeared to be heading to half time goal-less until Berwick broke the dedlock, Annan were attacking the Berwick goal in the last third when Berwick broke up the move and a swift couple of passes carved open the Annan defence and Andrew Russell finished with a low shot into the corner of the net across the outstretched arm of Hart to give Berwick the half time advantage. Berwick got off to the best possible start in the second half when they doubled their lead in the 50th minute. It was a goal created down the right with Steven Notman picking the ball up in acres of space and finishing with a low shot which Hart parried but the ball fell invitingly for Andrew Russell who had the simple task of slotting the ball into the open net from 7 yards. Annan replied almost immediately and it was Breslin who had a big say in the build up when he won the ball in a challenge with Willis to play the ball to Weatherson who slipped the ball out wide to Josh Todd who showed good composure to direct a low shot into the corner of the net past the diving Michael Andrews to give Annan a route back into the game. Steven Black was booked in the 55th minute and a minute later Berwick won a free kick on the edge of the 18 yard line bang in the centre of the goal but Paul Willis’s effort failed to hit the target and the opportunity was lost. Andrew Russel shot past the post and at the other end Weatherson’s near post header went close. 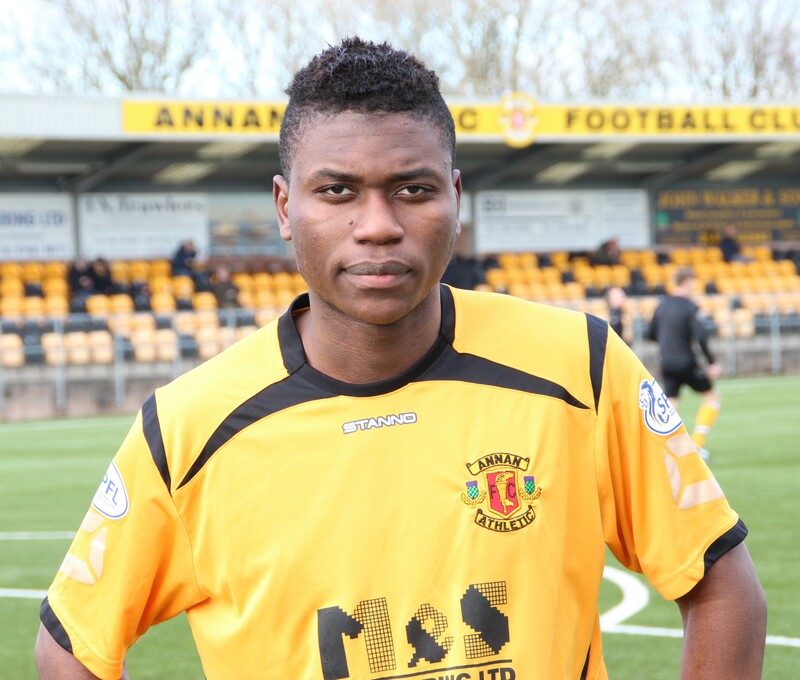 Annan brought on Junior Ogen in the 72nd minute for Stuart McColm and it was the on loan Rangers player Ogen who grabbed the important eqauliser in the 76th minute when his powerful header from Ryan McStay’s free kick gave keeper Michael Andrews no chance. Annan were on the ascendancy for the first time in the match and shots from Weatherson and Omar going close, at the other end Hart denied Paul Willis. Andrew Russell then missed a great opportunity in the 86th minute when he scooped the ball over the bar from 6 yards after Notman had created the opportunity. This was not one of the best matches played but it was important for both teams, for Annan one more victory will almost certainly ensure they will escape the play off zone at the bottom. Berwick will look back on the game with regret as they were very much in command at one point until the game started to drift out of their grasp and they face a real battle with their game at Montrose next week taking on a far greater significance. BERWICK RANGERS : Billy Bald (Michael Andrews 20 min), Devon Jacobs, Scott Maxwell, Colin Cameron (Lee Currie 72 min), Kerr Young, Jonny Fairburn, Paul Willis, Steven Notman, Andrew Russell, Darren Lavery , David Gold (Ross Gray 83 min). Substitutes Not used Blair Henderson, Ben Miller, Euan Bauld. ANNAN ATHLETIC: Jordan Hart, Jack Breslin, Steven Black (Callum Cook 62 min), Martin McNiff ( Rabin Omar 20 min), Steven Swinglehurst, Steven Sloan, Andrew Mitchell, Ryan McStay, Peter Weatherson, Josh Todd, Stuart McColm (Junior Ogden 72 min). SUBS NOT USED: Jordan Brown,Steven Logan, Alex Mitchell, Chris Dickinson.